June already! This is a crazy/busy month for me, celebration-wise. It's my Dad's birthday, Father's Day, my niece's graduation, two other niece's birthdays, one of my sister's birthdays, both of my sister's coming for a visit, and my birthday. That's a lot of celebrating! 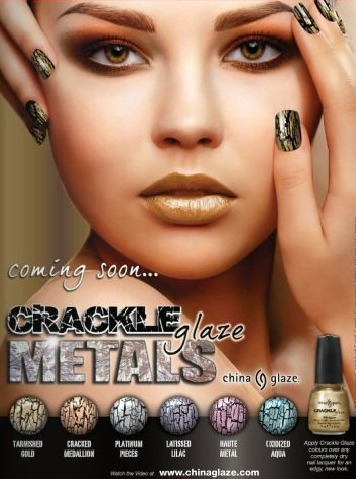 Let's celebrate the month with one follower winning the China Glaze Crackle Glaze Metals Collection! If you'd like to enter for a chance to win, just send me an eMail (mej0620@hotmail.com) with the words Metals Collection as the subject line, and include your first name and last name (or at least the first initial of your last name). Contest ends 6/25/11 at midnight, and the winner will be announced Monday, June 27 in my Come Monday weekly newsletter. Followers only, please. super excited about this collection! omg i would love this! good luck everyone!